Exactly as I predicted earlier this week that TimePey is a Branchless Banking Service by Zong. 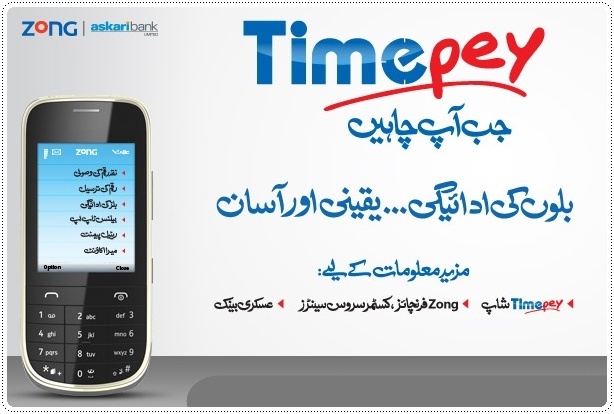 Yes, TimePey is a Mobile Money Handling Service by Zong. Today (1-December-2012) in a launch event held in Karachi Expo Center, Zong officially launches its Mobile Money Transfer service named as Zong TimePey. Utility Bills’ Payment, Mobile Account and Funds Transfer are the three main services offered. The facility to send or receive money through Timepey shops, franchises and customer services centers is also available. Timepey is most reliable as it is a service from Zong, the fastest growing cellular network in Pakistan, backed by Askari Bank Limited. How to open TimePey Mobile Account ? The Timepey Mobile Account can be opened and operated by anyone having a valid CNIC and an active Zong SIM. Timepey Account can be opened at any Zong Franchise, Customer Service Center or Askari Bank Branch.